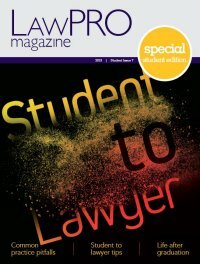 Midway through their articling terms at LawPRO we asked Raymond Ashurov and Rahim Andani to reflect on their law school experiences and how they relate to their early working experiences. 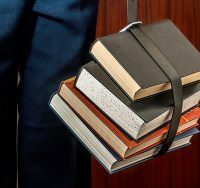 At the beginning of law school, it is important to learn how to best manage your time and what study techniques produce the best results. Rahim shares that it is not the number of hours spent reading and studying that lead to the best results but finding the type of studying that works best for you. He found attending every lecture and taking detailed notes on the information the professor highlighted got the best results for him. Raymond adds that it is not only important to manage the time spent com­pleting readings and studying but to also ensure a balance between academics and personal life. Working experience while at school can give you a taste of the skills that will be most practical. “I worked in a pro bono legal clinic where I was able to carry my own case files giving me the opportunity to represent and advocate for clients on my own while under the supervision of a seasoned lawyer,” said Rahim. “It gave me the opportunity to draft emails to the opposing party and have them reviewed by my supervisor. Sometimes they would rewrite the entire email, but each time I would learn from their changes to improve my writing for next time.” While both Raymond and Rahim gained a lot of practical skills and experience from their extracurricular activities, Raymond advises first year law students to focus on academics and only participate in one or two extra­curricular activities until they settle into law school. In law school, it can seem nearly impossible to complete all the required readings. Raymond stresses the importance of learning to read with the point of the case in mind to avoid getting bogged down by all the details. This is a skill that he says has also been very important during articling when he was required to read multiple cases to write a memo on a deadline. Law school has a reputation for encouraging competition but both students noted that this was not completely true. Rahim stated that many students he knew did not enjoy the competitive nature of some aspects of law school such as on-campus interviews but it is something that every student needs to learn to manage. Of course, every student wants to achieve academic success but in Raymond’s experience students were often eager to support each other and work together. Knowing how to work well with colleagues can be a real strength in the workplace. Sarah Van Schepen is Communications Coordinator at LawPRO.